Heart failure (HF) is a common, highly morbid, and costly clinical syndrome with a growing impact on global public health. Hypertension is the most prevalent risk factor for HF and carries the highest population attributable risk among all risk factors for HF. Approximately 40% of HF cases in men and 60% in women are attributed to hypertension. Epidemiological aspects of HF differ by HF type. Patients with HF with preserved ejection fraction (HFpEF), as compared to HF with reduced ejection fraction (HFrEF), are older and have hypertension and atrial fibrillation more frequently, while a history of myocardial infarction is less common. Furthermore, the incidence and prevalence of HFpEF increase more steeply with age as compared to HFrEF. The reasons for HF epidemic differ by country income. While in high-income countries it is largely driven by aging of the population, in middle- and low-income countries it is also related to the increase in age-standardized prevalence of hypertension. Absence of hypertension, obesity, and diabetes substantially prolongs HF-free survival and life expectancy. Treatment of hypertension, particularly in individuals aged over 60 years, is associated with the largest reduction of HF compared to other cardiovascular events. 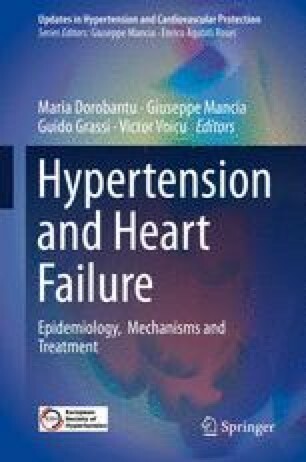 This chapter describes in detail the epidemiological aspects and trajectories of the relationship between hypertension and HF. Supported by grant No. 15-27109A provided by the Ministry of Health of the Czech Republic.